Junior Nattie McCullough has always been that under-the-radar straight girl who hangs out in the cafeteria with her gay-straight alliance friends. She’s never been the girl that gets the guy, let alone the girl that gets a hit song named after her. But when last summer’s crush, smoking-hot musician Sebastian Delacroix—who has recently hit the mainstream big-time—returns home to play a local show, that’s just what she gets. He and his band, the Young Lungs, have written a chart-topping single—“Natalie”—which instantly makes Nattie second guess everything she thought about their awkward non-kiss at that June pool party. That it was horrific. That it meant nothing. That Sebastian never gave her another thought. Blair Thornburgh is the author of several books for kids and teens. 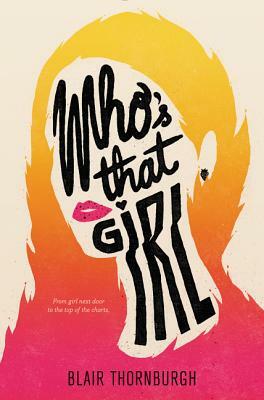 Her first novel, Who’s That Girl, was named a Bank Street Best Book of the Year. A graduate of the University of Chicago and of Hamline University’s MFA program in Writing for Children and Young Adults, she lives outside of Philadelphia (in real life) and at www.blairthornburgh.com (online). “Charmingly awkward and rooted in the bonds of friendship more than romance, this is a sweet, funny debut.